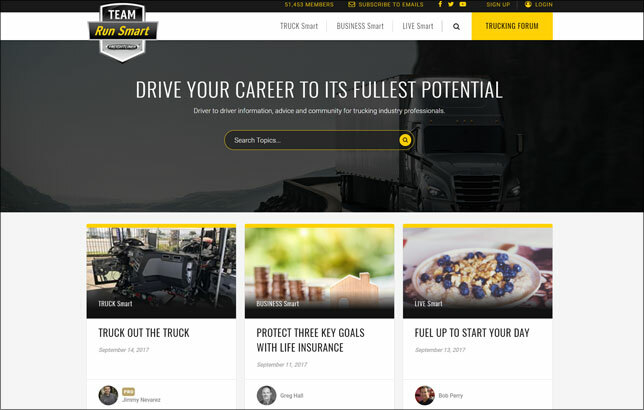 Freightliner Trucks has launched a new version of its Team Run Smart website, an open online community that truckers can turn to for expertise on a variety of topics. With over 48,000 members, Freightliner has enhanced the website for an improved user experience, easier access to information, and additional content to assist owner-operators and fleet customers at becoming better at the business of trucking. Freightliner solicited feedback from its current member base, as well as surveyed outside perspectives to update the site for a more user-friendly experience. “We are committed to continually improving our platform, and what better way to do so than by listening first-hand to the trucking community,” said Mike McHorse, on-highway product marketing manager, Freightliner Trucks. Sign up to join the Team Run Smart community.